Restaurant crawls and progressive dinners are common in Australia. They take you to a few establishments in one night with a curated dish and drink at each venue. Founders Simon Ward and Gael Ward from Perth took this popular dining concept from downunder and adapted it to the luxury travel market in Bali in 2013. 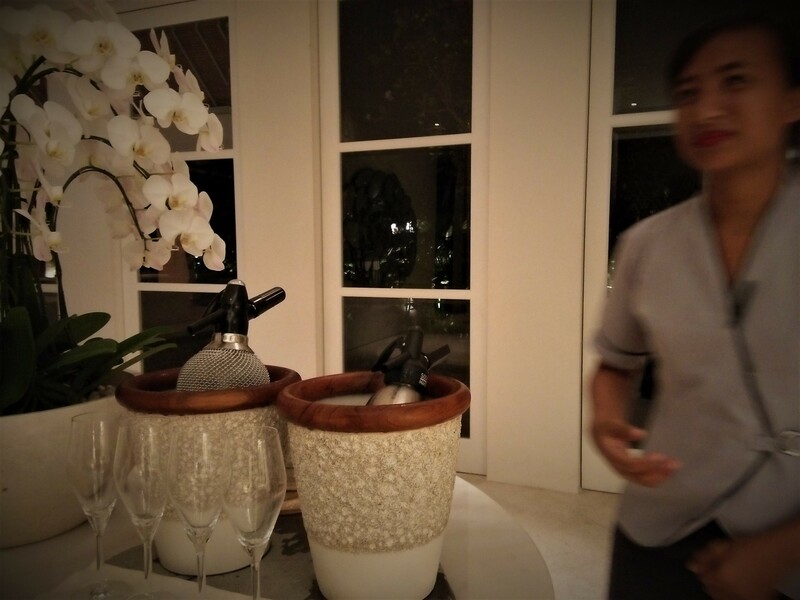 Their premium food tours have since turned heads and placed many forks on high profile restaurant tables in Jimbaran. In an area crowded with dining options, this culinary tour operator is opening the shells of gastronomy and revealing the pearls within to foodies. It is also helping repeat guests to have an enjoyable epicurean night out at venues known for their high standards of food and service. Here are 8 reasons to eat your way through Jimbaran's finest restaurants with Bali Food Safari. The region of Jimbaran is made popular with scenic sunsets and fresh seafood brought in daily by local boats. This seaside town and fishing village on Bali's west coast is also home to several world-class luxury resorts including Four Seasons Resort Bali at Jimbaran Bay, Le Meridien Bali, AYANA Resort & Spa Bali and InterContinental Bali. The congregation of high-end accommodations also support the proliferation of upmarket restaurants like Sundara, UNIQUE Rooftop Bar & Restaurant, Cuca and the infamous Rock Bar. The culinary tour will visit several well known dining venues where you can enjoy scenic Jimbaran with its coastline of golden sand beaches, turquoise waters and capture the very best sunsets in Bali. I'm heading to a progressive dinner in Melbourne during the Melbourne Food and Wine Festival. Bali Food Safari offers a similar multi-venue degustation experience with up-market restaurants. The main difference is you can join this restaurant hopping tour any day of the week in Jimbaran and not have to wait for a major food and wine event. Furthermore, your personal gourmet festival goes for 5 to 6 hours. Each culinary tour in Jimbaran takes a group of up to 10 persons each time. Everyone travels together but the great thing is you're still on your own private dining journey. You get your own table as a couple. You can book the tour as a large family and be seated together. Better yet, you can convert the restaurant crawl into your own group food and wine adventure or corporate event by reserving all ten spaces. Ask and you shall not receive. 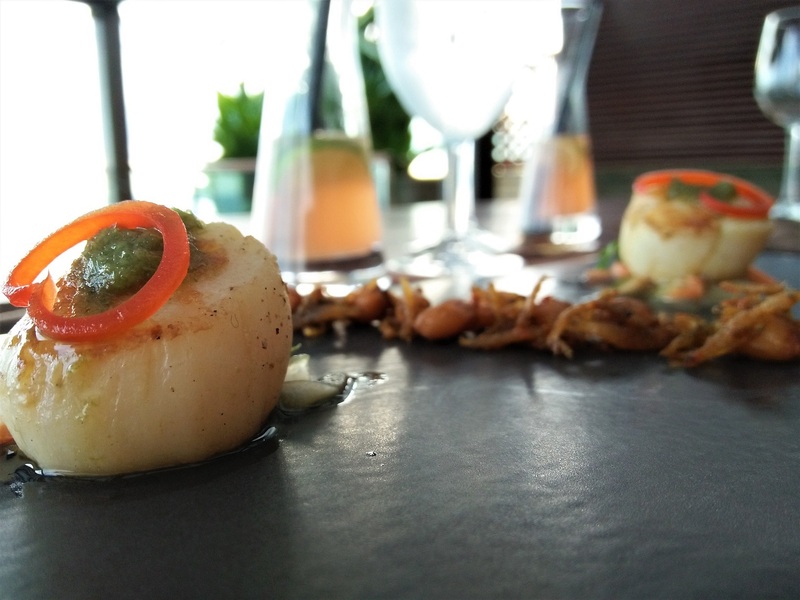 No matter how you query, coax, beg or demand for information about the restaurant venues on your Jimbaran itinerary, you'll be rewarded with scraps for clues. There aren't even any leads in the confirmation and reminder emails. 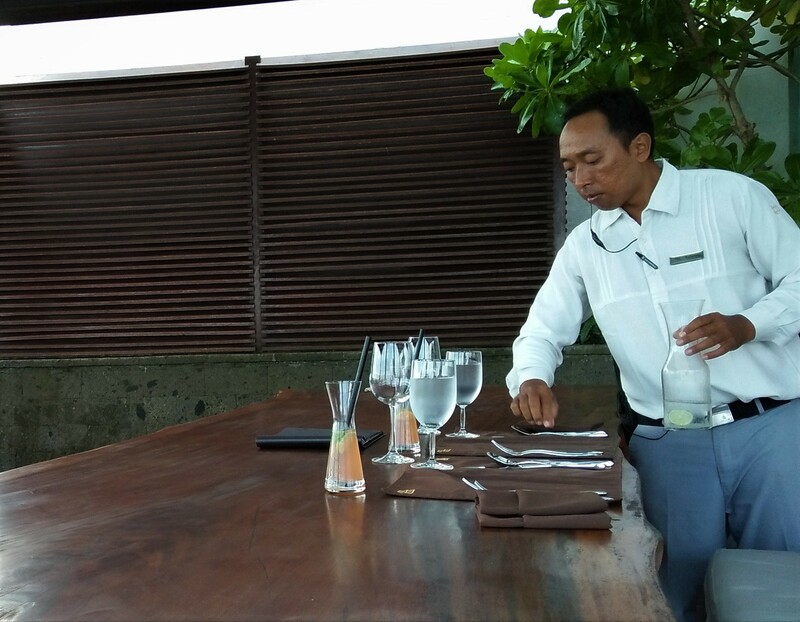 Bali Food Safari has designed an element of suspense and surprise, transforming the Jimbaran tour into an adventure for the senses. Expect a drip-feed of answers only with each approaching venue. Throughout the evening, you will be ushered to 4 different restaurants around Jimbaran, with each serving up 3 dishes to impress the sarongs off you. Do the maths and you'll realise its 12 dishes in one culinary tour. That's plenty to savour. Its not just the amount of food but the cornucopia of flavours that will send your taste buds on an adventure. The experience is unhurried. There will be ample time to stop and wander around each venue, take in the views and decor before sitting down to table service. Make sure to skip lunch in preparation for this night of feasting. The first venue opened the palate with a welcome drink and early sunset views over a cliff. Its seared scallops, crusted on the outside and medium to cut was the highlight for me. 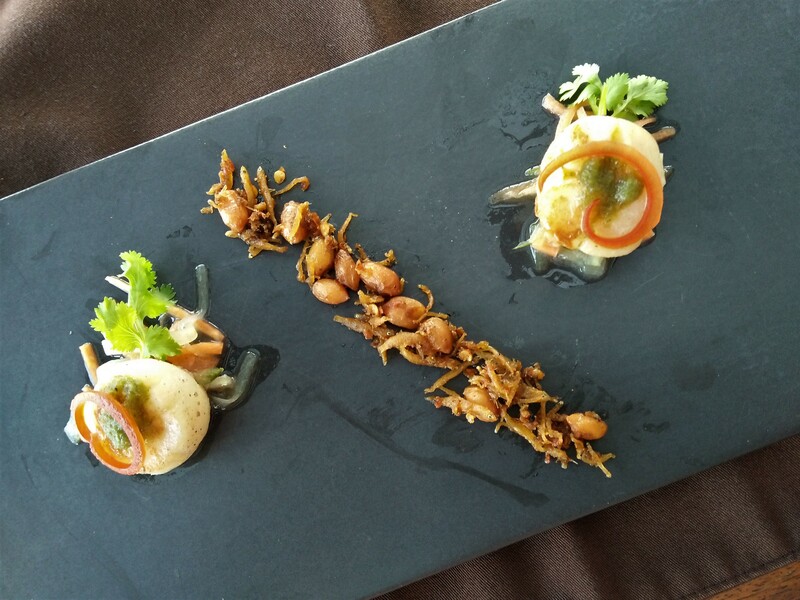 The second establishment served up a vista of fast approaching sunset at the beach paired with the theatre of tossed fresh crab salad with grated coconut and local herbs at the table. The third restaurant provided night views of the surrounds accompanied by large and delicious morsels of twice-cooked duck wearing crispy coats over moist insides. The fourth and final venue dazzled with modern interpretations of sweet concoctions. It presented a sunny-side egg with yolk and white made from mango, whipped coconut and frozen passion fruit. 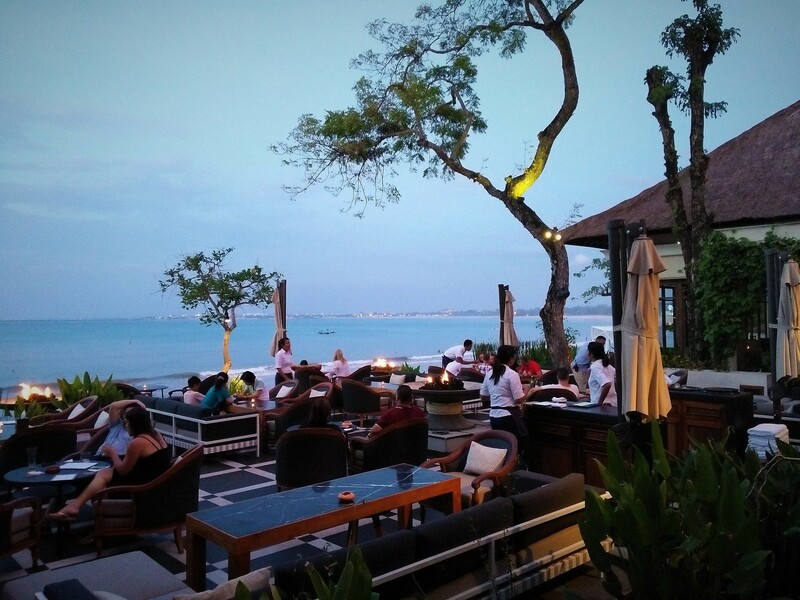 The Jimbaran dining scene is ripe with upmarket restaurants. Bali Food Safari cuts through the noise and presents a selection for your dining pleasure. This is an excellent way to taste test various restaurants without having to fuss over table reservations, choice of dishes and dietary needs. The service works even better when you have a large group. Add to that a concierge and driver to accompany you throughout the evening, with meet-and-greet at the hotel, shuttle between restaurants, dining arrangements at each venue and return to the hotel. Just leave all the heavy lifting to them, sit back, and enjoy the culinary journey laid in front of you. While you're spending good money and savouring some of the best food experiences, Bali Food Safari is taking some of that tour earnings and generating some positive karma for you. While it's not an industry practice, it is comforting to know that this Australian-owned food tourism company is giving back to local communities like Bali Kids in Bali. Good on you Simon and Gael. Where are the Best Massages in Kuta and Legian? Where is the Best Street Food in Sanur? Where is Ubud's Best Restaurant?